This web exhibition is supported by the Westport Cultural Council through a grant from the Helen E. Ellis Charitable Trust administered by Bank of America. Our thanks to New Bedford Whaling Museum (NBWM) photo archives for providing many of the images for this exhibition. Hall, Katherine Stanley and Sowle, Mary Hannah. 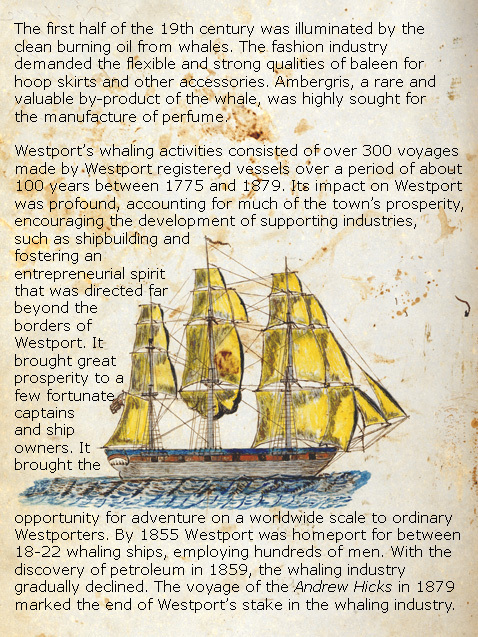 The Village of Westport Point. E. Anthony and Sons, Inc Printers, New Bedford MA, 1914. Kugler, Richard. Shipbuilding in Westport. The Bulletin from Johnny Cake Hill, 1983. Lund, Judith Navis. Whaling Masters and Whaling Voyages Sailing from American Ports: A Compilation of Sources. New Bedford Whaling Museum, Kendall Whaling Museum, and Ten Pound Island Book Co. 2001. Starbuck, Alexander. History of the American Whale Fishery, from Its Earliest Inception to the Year 1876. 1878. (Report of the U.S. Commission on Fish and Fisheries, Part IV, Washington, D.C., 1878.) Repr. 2 vols. with preface by Stuart C. Sherman, New York: Argosy, 1964. Repr. 1 vol., Secaucus, N.J.: Crown, 1989.